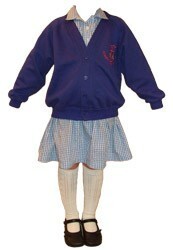 There is a school uniform, which increases the sense of belonging to the school community and adds to general ‘smartness’. 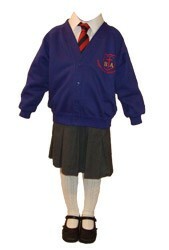 School ties can be purchased via the School Office (which can also advise on the purchase of sweatshirts, cardigans, polo shirts, fleece jackets and personalised backpacks all embroidered with the school emblem though wearing uniform items with the emblem is not compulsory). Sensible school shoes, predominantly black in colour, to be worn throughout the year. No boots or sandals. Navy shorts and white round necked T shirt. White socks, plimsolls or plain trainers (no bright colours or flashing lights) preferably with Velcro fastening. Football boots, shin pads and black/navy football socks. 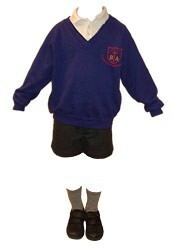 (Football kit may not be worn for lessons other than football). Plain black sweatshirt and plain black jogging bottoms/tracksuit bottoms for Winter. Plain swimming costume or trunks (not bermuda shorts), hat and towel in a waterproof bag. Drawstring PE bag and a plain sun hat or cap. Long hair should be tied back with ribbon or a hair band. No fashion hair accessories please. Please ensure that ALL your child’s clothing and property is named. The wearing of jewellery is not permitted for safety reasons. If your child has pierced ears, only stud earrings are permitted and these are best left at home on PE days. Otherwise they should be removed during exercise (compulsory for swimming) or taped over. Sensible school shoes, predominantly black in colour, to be worn throughout the year. No fashion heels, sandals or boots. Navy shorts and white round necked T shirt. (No designer labels). Football boots, shin pads and black/navy football socks. 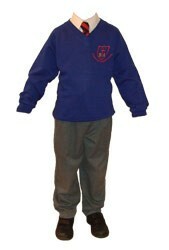 (Football kit may not be worn in lessons other than football). Plain swimming costume or trunks, hat and towel in a waterproof bag. No long surf shorts or two piece suits please.